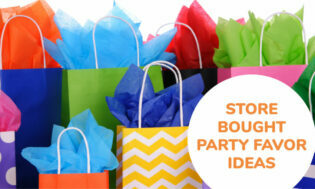 Need a few creative kids party favor ideas? Look no further. 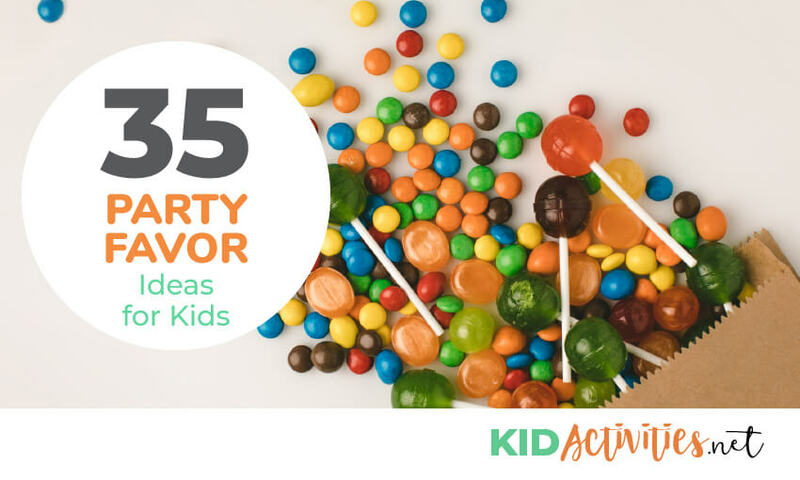 Plus, read on for additional ideas for party activities that will keep your kids giggling all day long! 7. Small puzzles and fidget toys such as Koosh balls, squeeze balls, bendables, etc. 30. Make craft stick picture frames with the kids; when complete attach a digital photograph of the child! 31. You can fill empty toilet paper rolls with small candy and tiny toys for a party favor. Once you fill it up– close up each end and decorate the tube… or wrap in tissue paper and tie the ends up with a pretty ribbon. 32. Party Crackers. To make, take an old paper towel roll and cut it in half or thirds. 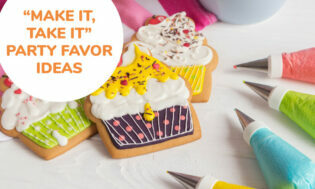 Place small favors such as erasers, tiny toys, stickers, or small wrapped candy inside. Roll the filled paper towel roll in party wrapping paper allowing extra paper at both ends. Twist the excess wrapping paper at each end and tie with ribbon or yarn. Party crackers!!! Need: plastic film canisters, crepe paper, popcorn kernels, stickers, glue, glitter, paint markers, ribbon, and cardboard tissue tubes. Have children fill film canister halfway with corn kernels and decorate with stickers. Adults can then poke a hole in the lid of each canister and children can thread some curly ribbon through the hole. Knot the ribbon on the underside of the lid and let the rest stream out of the top. To make the streamers, have children glue (or have a staff member staple) lengths of crepe papers to the inside of a cardboard tube. Decorate as desired. Cover toilet tissue tubes with red or blue construction paper and have children decorate them with silver star stickers. Cut red, white and blue crepe-paper streams –into long and narrow strips. Have children glue the strips to one end of their tubes to make pompoms for shaking. 35. Make a Party Lei. Great to make for a party, celebration or just for something pretty! They aren’t only for a Hawaiian theme! Lay out pre-cut long pieces of string, twine, raffia, or fishing line, long-tube pasta and plastic or fabric tropical flowers. Kids can string together the flowers and pasta to make a fun to wear lei necklace. Music & Dancing. Who can hear the music and not feel good! Not only fun at parties but it increases flexibility and balance. A variation to the traditional Limbo is to go under the rope or limbo stick in pairs. Be sure to play the music! Beyond the traditional—be creative and change the words to fit the themes. This is in the Low Energy Game Category but would also be fun to start or end a party! Place a piece of chocolate candy in your mouth and see how long it takes to melt! No sucking and chewing it! The one to keep the chocolate in their mouth the longest is the winner. You need 28 Styrofoam or paper cups (not transparent) and 2 each of 14 different pairs of treats to hide such as sweets (candy), treat-sized chocolate bars, or tiny gifts. When nobody is looking put the treats in a rectangular grid pattern (7 x 4) on a table and cover with the cups to make a “concentration” game. The children take turns in turning over a pair of cups. If the treats underneath match, they may take the cups away, claim the treats as their own and have another try. If they do not match, they must carefully replace the cups and play passes to the next player. Increase or reduce the number of cups and pairs of objects to suit the age and ability of the children. 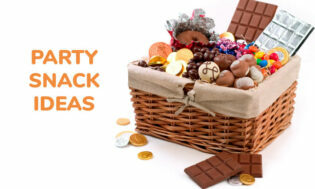 For a party game for older children, reduce the number of “treats” and throw in the odd booby prize! You could also hide an “instant forfeit” under one or more of the cups–choose something that all the kids at the party would be happy to do. For Mexican Theme: Count the nachos! Take a large glass spaghetti jar or similar; carefully fill it with nachos. Keep count as you add them, and try not to break any! The winning child get to open the nachos for all to share, as well as get a prize. Sunflower or Fall Theme Party. Guess the closest number of seeds in a live sunflower. The number can exceed 1000! 1. Divide kids into teams 1-4 teams depending on how many are at the event. 2. Make up clues and scatter them over the party area (or outside if weather permits). 3. Each clue leads to the next and at the end of the trail is a treasure for the team, for example, food, party favors, or prizes. 4. Tip: Color code clues so teams only find their own clues. Time the hunt and see which team gets done first. Have children follow clues, a map, or footprints, or arrows (made from sticks or small rocks) to find a special treat (favor bags or food). To make footprints, cut a stencil out of paper and then sprinkle flour inside the cutout area. Younger children can dig for treasure (coins, small plastic animals, etc.) in a sand box. Have children toss coins into pie pans or targets chalk-drawn on the ground. Other objects that can be tossed include: buttons, poker chips, peanuts, clothes pins, balls, playing cards, dried beans or washers (hardware). Objects can be tossed into milk bottles, plastic drinking glasses, bowls, plates, muffin pans, egg cartons, coffee cans, jars, shoes, hats, flower pots, boxes, and even an open umbrella. For an extra challenge toss objects into pie pans floating in a children’s wading pool. Have children toss balls into buckets, laundry baskets, or through hula- hoops hung from a tree. The Worm Squirm is great for a pajama party! This is an obstacle course made of pillows, boxes etc. When it’s your turn, you squirm like a worm on your belly to complete the obstacle course. All players inflate their balloon. Some players may need help. When the leader says “1, 2, 3, GO!” The players release their balloons in the direction of the target. If you are having a theme party, use a picture with the theme as the target center. 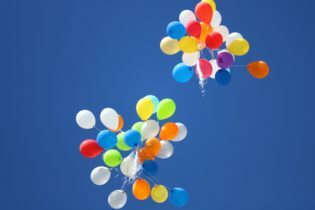 Score 5 points for the closest balloon and 15 points for a direct hit.This game works well with teams – each team gets their own colored balloons; red, blue, green etc. Or, you do not need to keep score at all and just have fun playing the game several times. Buy or make a painted wood or cardboard bean bag toss. Make the shape according to the theme. Use bean bags to toss—or be creative and toss something based on the theme. Example: Scrunched up white paper or large marshmallows for a winter theme. There are many “Bean Bag” game ideas here. Have children sit in a circle and pass one favor bag until the music stops. The child holding the favor bag when the music stops– keeps it and steps inside or outside the circle. The game is repeated until every child has a favor bag. Use items you already have to create an obstacle course. For example: children might need to crawl through a box, walk across a board, do a hula hoop, jump rope, ring a bell, etc. before they reach the finish line. Time each child with a stop watch and encourage him/her to try to beat their own time on the 2nd try (instead of worrying about the other children’s times). Give ribbons or stickers to each child. Customize the traditional pin the tail on the donkey game to fit your party theme. Play ‘Pin the Tail’ on the Zebra for a Jungle Safari Party and ‘Pin the Horn’ on the Unicorn for a Wizard Party. Draw your own or use pictures from magazines, coloring books, or clip art programs and have these enlarged at a local copy center. Have children sit in a circle and pass around an object (a stuffed animal works well) until a timer goes off. #1 The child holding the object when the timer goes off is “the silly monkey” or whatever fun name ties in with your party theme or the object the children are passing. Play just like hot potato only with an ice cube. When the music stops clap for the person with the ice. You can also keep passing the ice to see how long it will take to melt-great for a hot outside party! #3 Play cold snowball like hot potato —using a large white Styrofoam ball. Play this like 20 Questions! Put an object in box and have children take turns guessing what it is. For younger children put the object inside a pillowcase and let them feel it. For a Halloween party play “Who is the Ghost?” One child leaves the room and one child in the room puts a sheet over his head. The child who comes back in the room tries to guess who the ghost is. 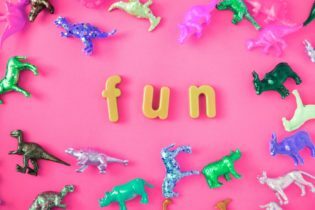 Play Twenty Questions and give clues related to people or objects that tie in with the party theme, such as famous baseball players for a Baseball Party, or types of dinosaurs for a Dinosaur Party. Have kids try to guess the correct answers. 1. Play Duck, Duck, Goose to fit the party theme. 2. Draw a Hopscotch Course that ties in with your party theme. Enample: for a St. Patrick’s Day Party draw a leprechaun in the start box, a pot of gold in the end box, a rainbow from one end to the other, and have children toss a gold coin on the course to play. 3. Play Simon Says, but change Simon to a name that fits in with your theme. Example: Replace the phrase “Simon Says” with Santa Says, then follow with the direction. “Put your hands on your head.”‘ All players should be their hands on their head. When the Santa gives an instruction without saying “Santa Says” and the followers do the action anyway, the leader says “HO! HO! HO!” and the player must sit down. 4. Play a friendly variation on an old favorite: Musical Chairs. Instead of pulling chairs from the circle and making kids sit out when they “lose,” have enough chairs for each child, but decorate one special chair and whoever sits in that chair receives a special treat. If you don’t have chairs, just make paper “spots” on the floor and make a special spot. 5. Another variation is MUSICAL BALLOONS where children throw balloons into the air until the music stops. This way to _________’s Party! Follow the steps to ________! This way to a good time! Follow the Footsteps to Fun!! This way to Summer Camp! 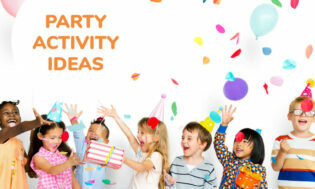 Be sure to check out the Party Tips for classroom and school-age program parties! Put small amounts of trail mix, cereal, pretzels, etc. in plastic sandwich bags and insert them in cardboard toilet paper tubes. Wrap the tubes in a piece of tissue paper and tie the ends with yarn or ribbon. Nice way to serve snack at a “party.” Give snack tubes to the children at snack time or to take home. In a large bowl, mix together such foods as dry cereal pieces, sunflower seeds, m&m’s, raisins, nuts, and mini marshmallows. For each child put a serving of the snack mix in the center of a party napkin. Bring the sides of the napkin together and tie with ribbon.